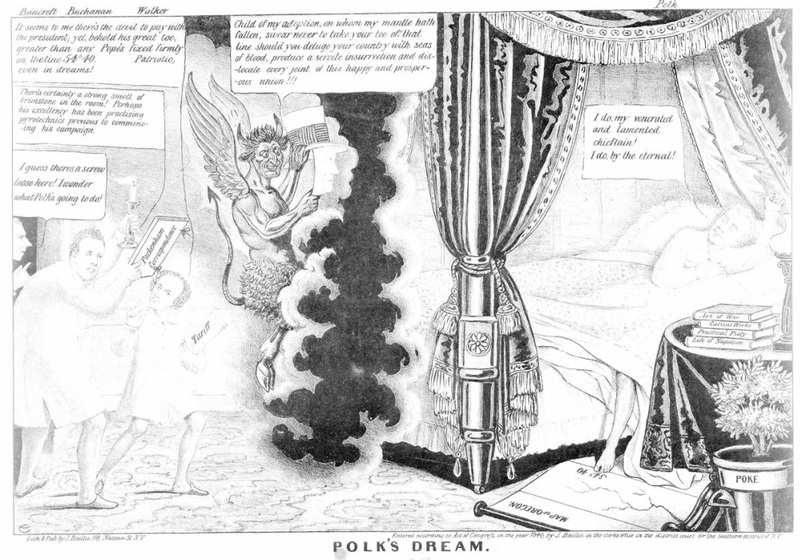 The cartoon above is from the 1848 Presidential campaign. Polk is confronted by a demon holding a mask of Polk's mentor, Andrew Jackson. Also in the cartoon are expansionist George Bancroft, Polk's Secretary of State James Buchanan who is carrying letters from British ambassador Richard Packenham. At left, dressed in nightshirts, three cabinet members steal into the room. They are (left to right) George Bancroft, James Buchanan, and Robert J. Walker. Treasury Secretary Walker carries a "Tariff" document, no doubt the controversial and recently introduced tariff bill of which he was generally considered the architect, and comments, "It seems to me there's the devil to pay with the president; yet behold his great toe, greater than any Pope's fixed firmly on the line 54.40. Patriotic even in dreams!" Behind Walker Secretary of State Buchanan, holding a candle and a portfolio marked "Packenham Correspondence," says, "There's certainly a strong smell of brimstone in the room! Perhaps his excellency has been practising pyrotechnics previous to commencing his campaign." The "Packenham Correspondence" refers to Buchanan's July 1845 note to British ambassador Richard Pakenham, wherein the forty-ninth parallel was proposed as a compromise. Pakenham's response, a rejection, touched off Polk's pursuit (at least temporarily) of a more hard-line stance, claiming the 54.40 boundary. "I guess there's a screw loose here! I wonder what Polk's going to do!" muses Navy Secretary Bancroft. 1. What are three issues in the Polk Presidency which appear in the cartoon? 2. What demonstrates Polk may be committed to his agenda? 3. Why is the demon holding a mask of Andrew Jackson? 4. Do the books on Polk's nightstand tell you anything about his values?